Inta has revealed that research conducted by insurance company Aviva has shown that multi-family households in the UK grew by 50% between 2005 and 2015. With an ageing population and an increasing number of adult children returning to their parental homes after moving out, multi-generational living in the UK is on the rise. Assuming the same rate of growth occurs in the next 10 years, there will reportedly be almost half a million multi-family households by 2025. Having two – or even three – generations living under one roof means families are required to adapt their home to meet everyone’s needs and one room where this can prove difficult, is the bathroom. So is the industry catering for this so-called multi-generational bathroom and does a happy medium for every member of the family really exist? Stuart Gizzi, Director of Bathroom Manufacturer for Inta, said: “When we design bathrooms we should be thinking about longevity, rather than just looking at short-term fixes. “Multi-generational bathrooms are not impacting the bathroom market as much as they should be and the industry needs to do more to embrace this growing trend. At the moment it is still a niche market but when you consider the rate at which multi-family living is increasing, the industry is not up to speed. Inta has, therefore, designed a series of independent living products for its Ever range, which aim to put safety first without compromising on aesthetics. 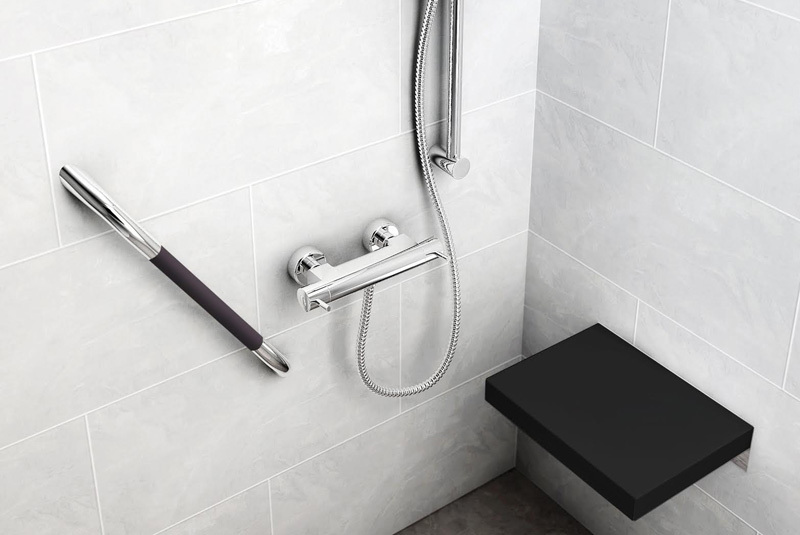 This includes polished copper and chrome grab rails and a slip-resistant shower seat in black and chrome. As well as designing contemporary fixtures and fittings, developing the latest shower technology is also said to be crucial to the advancement of multi-generational bathrooms.